Even with very modest equipment, such as a 50mm lens on a fixed tripod, it's possible to get very nice pictures of Hale-Bopp. This was my first attempt, back in February, from a pullout off Montebello Rd in Cupertino, with about a 20-second exposure. On the original slide, you can make out the different colors of the two tails. 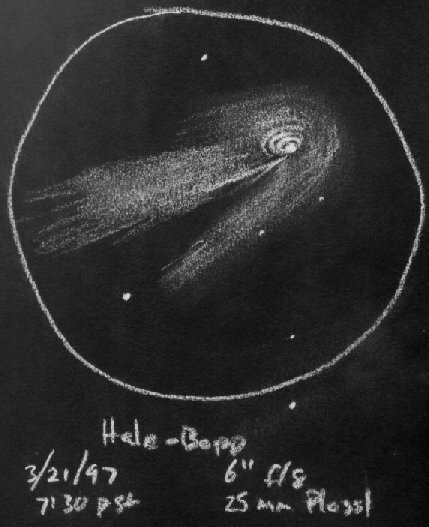 Through a telescope, the view of Hale-Bopp at its peak was impressive. The nuclear region showed a helical structure, caused by material thrown off by a rotating jet in the nucleus. Unfortunately, this structure was very difficult to photograph, and much more was visible visually than could be captured in a photo. Hence, sketches are the best way to see the structure. Here are two sketches I made in late March, using my 6" telescope at 48x from my suburban backyard. The best animations of the rotation I've seen are an amazing animated sequence of images by Brad Wallis showing the formation of the hoods as the nucleus rotates, and an equally amazing, but quite different color mpeg animation by Terry Platt showing a full rotation cycle. Gerard Therin has a CCD image which shows both the nucleus and the tail -- the closest photo I've seen to the comet's visual appearance. 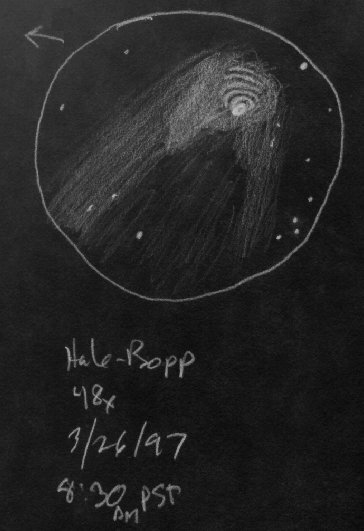 David Hanon has a nice image of the structure in the JPL Hale-Bopp image archives. Al Kelly has a CCD tricolor image of the structure. The Drawing by Uwe Hein is also very interesting and gives a better idea of what can be seein visually (more than the photographs show). 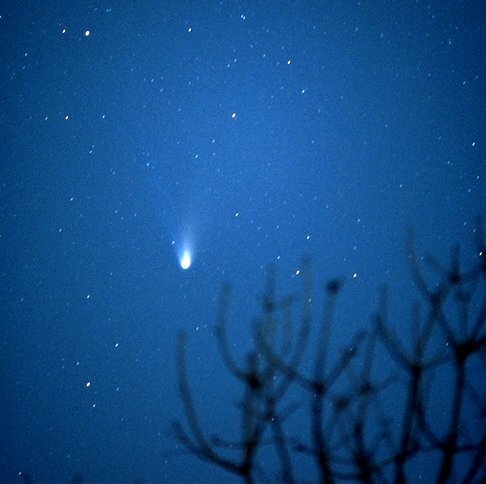 In binoculars, Hale-Bopp was a beautiful sight. I made this sketch viewing with 8x42 Ultraview binoculars from my backyard. 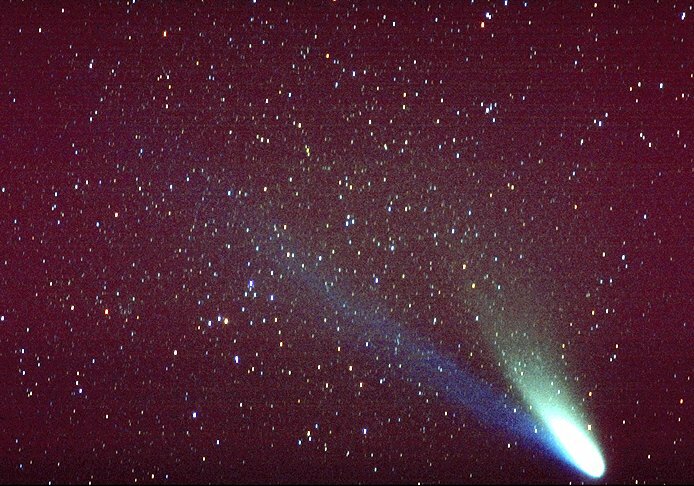 My first comet shots were of Comet Hyakutake. I used a flimsy backpacker's tripod and Provia 1600. I was proud of them at the time. Hyakutake with a 50mm f/2 Nikkor. The clearinghouse for reports and photographs on this comet is the JPL Comet Mirror Site, which is a mirror of the original JPL Comet Site. 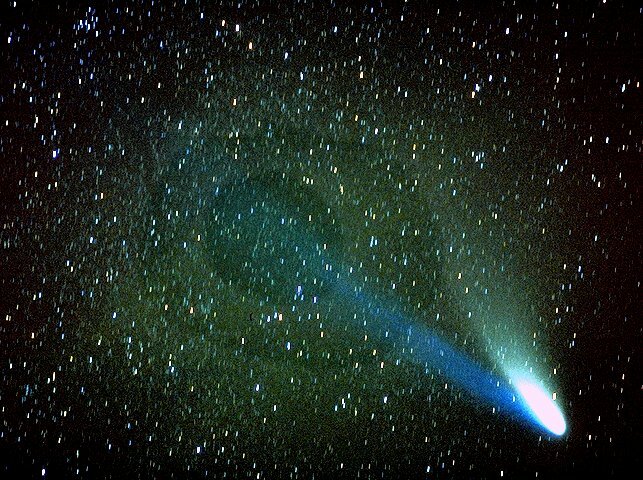 You should also check out the great images and videos of the Comet Watch Program. 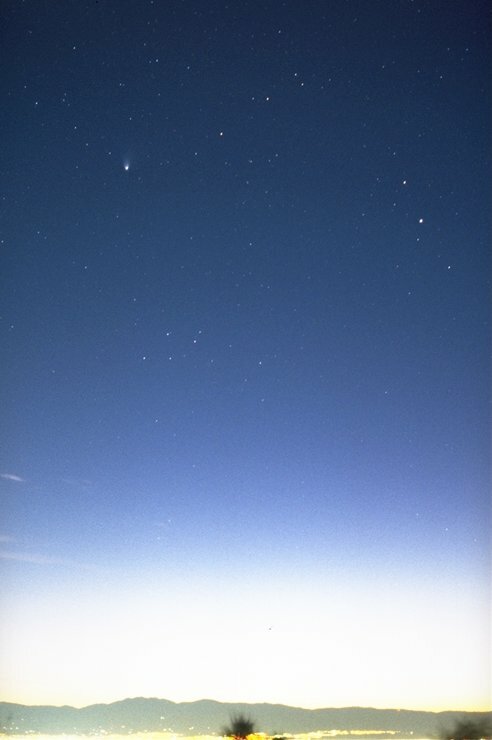 I think the most beautiful scenic shot I've seen yet of Hale-Bopp is Dan Baldwin's lovely shot of the comet over the Colorado Rockies with M31 (the Andromeda galaxy) below it. Wow. I want to move to Colorado. 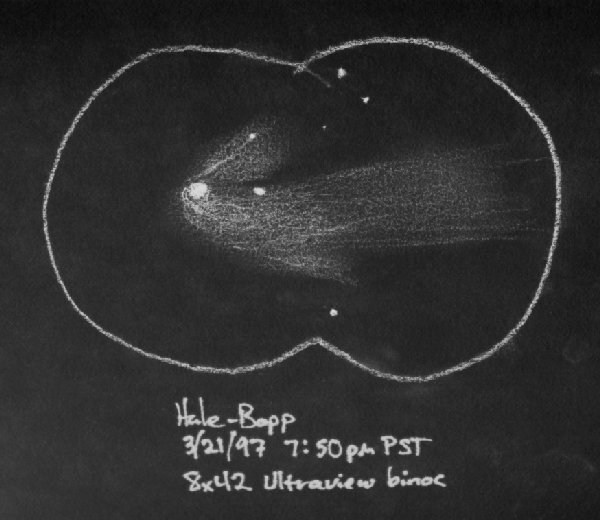 Comet anti-tails (Hale-Bopp sported one several months ago, though I didn't see it personally; the anti-tail seems to have disappeared by now).